Sticky notes can be your best friend during wedding planning. Especially when it comes to the seating plan. I used them for my own seating plan and it made it so quick and easy! 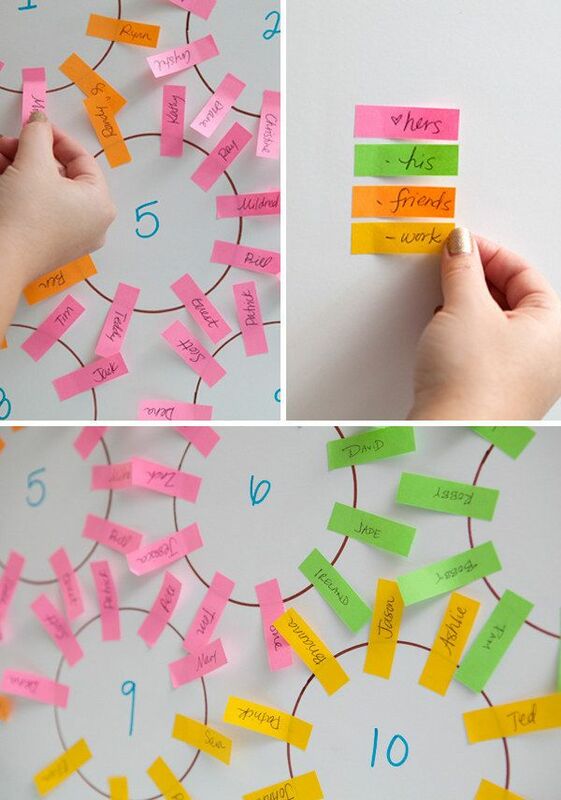 Get a stack of mini sticky notes and write each guests name on one. It’s easy to move them around without having to write our the whole thing again. You can even use different colours for friends/family etc. RSVPs can be a nightmare! So make things a little easier for yourself and number them! Sounds crazy but if you get one back that’s unreadable or they’ve forgotten their name, you’ll still know who sent it. Simply make a list of everyone you’re sending an invite to, number them, then write the corresponding number on the rsvp. Sometimes you’ll have a lot of invitations to send out, and if you haven’t got self-sealing enveloped save yourself from licking them all by using a glue stick or a foam brush dipped in water. Invest in a personalised address stamp. You’ll save loads of time when you’re sending out your invitations as you won’t need to write out your return address over and over again! Like this cute one from Not On The Highstreet. The one thing you don’t want to do the day before or day of your wedding is answer calls and texts from guests. When sending out invitations, include a list of contact numbers like a bridesmaid’s or groomsman for guests to contact if they get lost on the way to the venue or anything like that! This way you’ll save yourself stress by not having to deal with other people’s mini dramas! A simple one is to book suppliers that you trust! If you know you can trust your supplier to do their job then it’s one less thing to worry about during the run up to the wedding. Let them do what they do best! Do you have any other wedding planning hacks? Let us know in the comments!